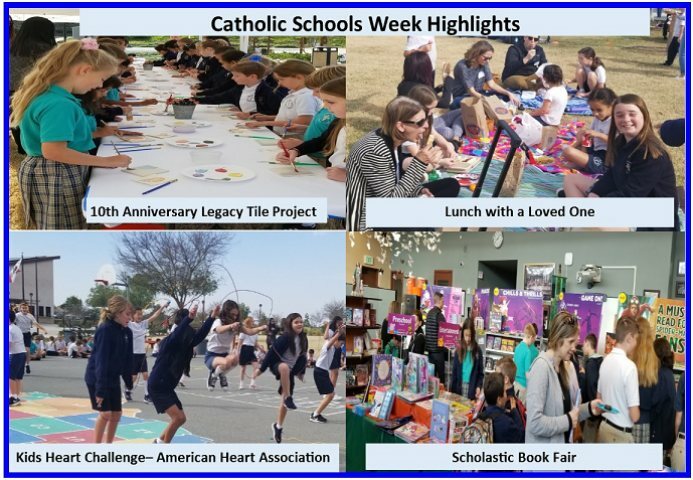 We were excited to welcome so many visitors to our Open House, which kicked-off our annual celebration of Catholic Schools Week. Students showed their Guardian spirit and hospitality welcoming over 200 guests to Lunch with a Loved One; demonstrated their creativity in designing and painting a tile for our 10th Anniversary Legacy Tile Project; celebrated diversity by sharing their heritage and traditions during Cultural Heritage Day; and supported the American Heart Association by raising funds through the Kids Heart Challenge. In addition, “bees” were buzzing as students participated in the school-level Scripps National Spelling Bee (8th grader Patrick O’Leary won by spelling the word “gondolier” correctly), National Geographic GeoBee (5th grader Luke Parker took the win), and our school Religion Bee (6th grader Adriel Reomales controlled the board for 1st place). We are very proud of all our students who took part in their classroom bees to compete in these schoolwide competitions. Congratulations to Patrick O’Leary who also won the Chapter, and beat out 10 other chapters, to win the District XIV level of the Daughters of the American Revolution (DAR) essay contest with his essay based on “The Women’s Suffrage Campaign.” Patrick has also been busy as captain of our Academic Decathlon team! Congratulations also to Kindergartener, Isabella Coombs, who placed first in the Diocese of San Diego’s Catholic Schools Week Coloring Contest. We are barely past the mid-year mark and our students have been phenomenal in their pursuit of academic and athletic excellence. They truly exemplify GUARDIAN PRIDE. Enrollment in all grades (Preschool through Grade 8) for the 2019-2010 school year has begun. For information about our Preschool, contact the director, Amy Igou, at (858) 397-1291. For information about our K-8 school, contact (858) 397-1290 or office@stggcs.org. Visit the school website at www.stggcs.org.